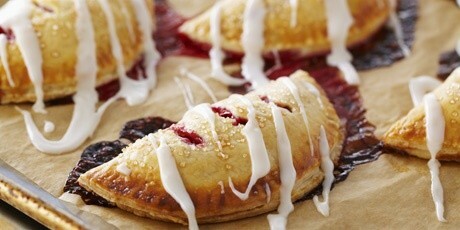 In episode Fruit Pies of TV show Bake with Anna Olson prepares Anna Olson recipe for Frosted Raspberry Hand Pies. Double Crust Fruit Pie Dough - Combine the flour, sugar and salt together. Add the oil and blend in using a pastry cutter, electric beaters or a mixer fitted with the paddle attachment, until the flour looks evenly crumbly in texture. Add the butter and cut in until rough and crumbly but small pieces of butter are still visible. Stir the water and vinegar (or lemon juice, if using) together and add all at once to the flour mixture, mixing just until the dough comes together. Shape the dough into 2 disks, wrap and chill until firm, at least an hour. Fruit Filling - Preheat the oven to 375 F and line a baking tray with parchment paper. lice the chilled pie dough into 6 pieces and roll each out to a circle about 6-inches across and just under ¼-inch thick. Use a 6-inch round cookie cutter to trim away the rough edges on each. Use a fork to combine the raspberries, apple, sugar and cinnamon, gently crushing the raspberries a little as you mix. Spoon the raspberry filling, dividing evenly, onto each of the rolled pie dough circles. Brush the outside edge half way around with a little of the egg wash and fold in half. 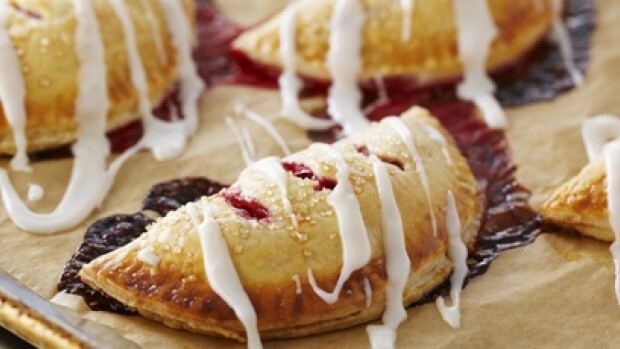 Pinch the edges of each hand pie in the same style as you would the edge of a traditional pie, fluting the edges. Place these on the prepared baking tray, brush the tops with egg wash and sprinkle with Turbinado sugar. Snip a few holes into the pies with a pair of scissors, so the steam can escape. Bake the hand pies for about 25 minutes, until the pie dough is a rich golden brown. Cool the pies before glazing. Glaze - For the glaze, whisk the icing sugar, milk (or water) and vanilla together until smooth and still fluid (adjust consistency by adding more icing sugar or liquid, if needed) and using a fork drizzle the glaze over the pies. Let the glaze set for at least an hour before serving.